My son was staring off into space, and I was yelling at him, “Son, where is your head? Why are you not listening to me? !” Having just arrived home from a 12-hour night shift as a nurse assistant, I was beyond exhausted and not understanding why my 14-year-old son was not ready for school. I also couldn’t understand why he wasn’t responding as he usually would. After talking to him for just a few more minutes, I observed him making an awkward, loud noise coupled with some involuntary muscle jerks in his limbs. Then, his head swung forward forcefully, right onto the dining room table with a loud boom. My son had experienced his first grand mal seizure, also known as a generalized tonic-clonic seizure. The odd stare that had come over his face, a pre-epileptic aura, signaled that a seizure was imminent. Still in my scrubs from work, I instantly sprang into mom mode. I knew what was coming next because of my own childhood diagnosis of Juvenile Myoclonic Epilepsy, which began when I was 14. I grabbed my son and lowered him to the floor as he went into a full grand mal seizure, and after the longest two minutes I have ever felt, his muscle spasms began to subside. He went into a deep, unresponsive sleep, known as the postictal state, for about 15 minutes. After an ER visit that day and several physician follow-up appointments, my son’s diagnosis of Juvenile Myoclonic Epilepsy was confirmed. This was the first time I had witnessed a seizure in another person, and in my own experiences, I would remember very little when I awoke from the postictal state. Because of my own experience with the disorder, I knew what was happening and how to respond; this kept me from panicking, but it was still scary and emotional to live through. As an adolescent with epilepsy, I endured years of exploring different medications, visiting many different doctors, and managing the difficult side effects of the drugs used to treat my condition. I did not want my son to have to go through the same thing, so I was very engaged with his care from the beginning. As a single mom of three boys, the younger ones being four and five years old, this new diagnosis was stressful to take on. However, I am happy to report that we are making strides and pushing through. My son has only had two more seizures since that day, and he now takes daily medication, at the lowest safe dose, to keep his seizures under control. In my own journey with epilepsy, I remember the peace I felt when we finally found a drug that not only worked well for the condition, but also worked for me. I was eventually able to learn how to manage my epilepsy and be attentive to my body, and although it took 11 years, I have been able to live with epilepsy, medicine free, for the past decade. I hope in due time, my son can reach a similar goal. For my son and for myself, I have learned to remain encouraged. More often than not, epilepsy is a condition that can be managed, and many can live a life that is nearly completely typical once they learn and listen to their seizure triggers. For parents, know that your child may need time to adjust to the terms of this condition, and your child will need you to remain strong through that process. If the side effects of any particular treatment or medication outweigh the benefits, continue to seek alternatives until you find one that will keep your child mostly as he or she was prior to the diagnosis. Although this experience will take you on a journey that may present some unexpected turns, remain steady and strong for your son or daughter to navigate through it successfully. Teara Young is the mom of three boys and a member of the Patient and Family Partnership Council at University Hospitals Rainbow Babies and Children’s Hospital in Cleveland, Ohio. As a first-generation college student, she completed a bachelor’s in finance and an MBA, working for eight years as a banker and financial advisor. She volunteered with the Patient and Family Partnership Council of the Seidman Cancer Center while her ex-husband battled T-Cell lymphoma skin cancer. 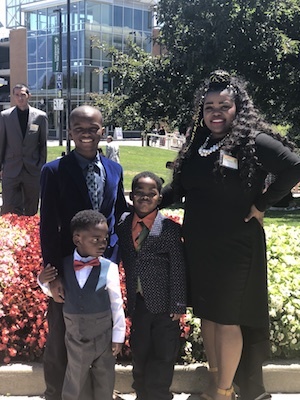 Complications during the birth of her third son reignited her passion for the medical field, and Teara is now working as a nursing assistant, completing her nursing degree, and looking forward to eventually becoming a nurse practitioner.